We're going to ignore Skyrim's console gamers in this piece (insert apology for implied insult here). Let's drill into the stats for PC gamers, specifically those who got the game through the Steam service. Steam tracks Achievements. 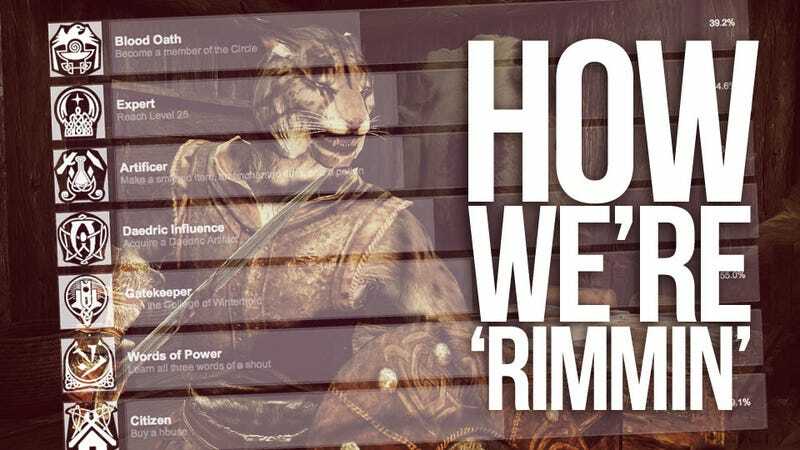 It doesn't tell us how many Skyrim players it is collecting data from—I asked Skyrim's publisher for them and will add them if I get them—but it breaks down the percentages of what they have done. The next batch of Achievements shows how sharply people's progress falls off. Skyrim is an enormous game and not everyone will proceed through the same quests or even bother to keep up with the main quest. Nearly 8 of 10 Skyrim players hit level 10, which happens fairly quickly, maybe even in a single, long afternoon with the game. But attaining level 25, which took one of our staffers 25 hours, has only been achieved by fewer than 5 out of 10 Skyrim players. Only 3 of 10 players wandered far enough to find 100 locations. Only a quarter of the people playing joined the Dark Brotherhood.